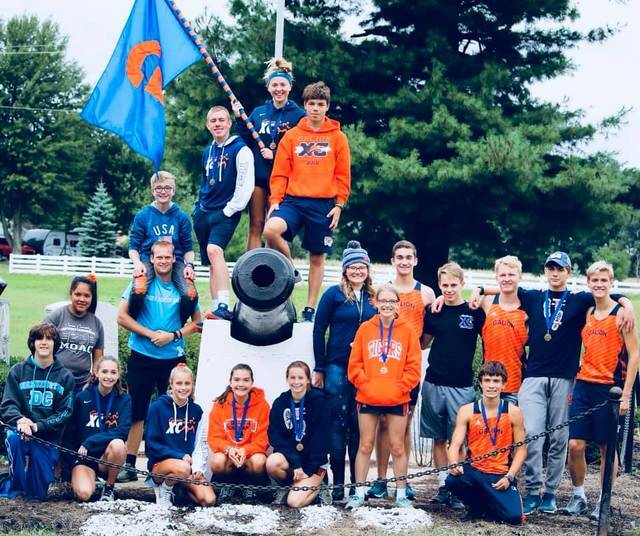 Photo submitted by Noresa Nickels The Galion cross country teams were in action at Amann’s on Saturday, competing in the annual Crawford County Meet. The Lady Tigers took home the title while the boys finished as the runner-ups. Braxton Tate won the boys event by more than a minute and a half over Colonel Crawford’s Braxton James. GALION — On Saturday, September 22, the cross country teams representing high schools throughout Crawford County gathered at Amann’s for their annual county meet. More than 90 high school runners were on hand for the race which saw team victories from the Galion Lady Tigers and the Colonel Crawford boys team. The Lady Tigers finished with 34 points to outlast the runner-ups from Colonel Crawford who tallied 37 points. Wynford clocked in with 74 points for third place and Buckeye Central rounded out the field of team scores with 82. For Galion, they had four of their six competing runners finish within the top-10 of the 35-runner field, led by a fourth place finish by Brooklyn Gates in a time of 21:41.65. The next three placers also belonged to the blue and orange in the likes of Airyona Nickels, Zaynah Tate and Sari Conner. Nickels snagged fifth with a time of 21:56.18 while Tate earned sixth in 22:05.32. Conner rounded out the Tigers’ top-10 finishers in seventh place, crossing the finish line with a time of 22:15.75. Emily McDonald and Ava Smith were also in the field for Galion and finished 15th and 17th, respectively. Colonel Crawford’s Ally Hocker won the race for the Lady Eagles, pacing the field with a championship time of 21:16.20. The black and yellow also earned the runner-up spot as Alison Manko finished her 5k in a time of 21:20.89. Katie Hopkins wrapped the Eagles’ top-10 finishers, coming in eighth place with a time of 22:24.88. Other Crawford girls in action on Saturday were: 11. Katie Hanft; 19. Courtney Lyons; 20. Sheba Sulser; 22. Madisyn Cook; 24. Theresa Dzugan; 27. Abby Hocker; 29. Emma Swisher and 30. Alivia Payne. Caitlin Harley, Crestline’s only representative, finished in 10th overall in a time of 22:35.55. Over on the boys side, Crawford reclaimed the title with 43 points to outlast the runner-ups from Wynford and Galion who both scored 52. Bucyrus finished fourth with 83 total points and Buckeye Central recorded 126 to claim fifth in the team field. A pair of Braxton’s took the top-two spots on the day as Galion’s Braxton Tate won the county title in 16:17.47 while the Eagles’ Braxton James finished as the runner-up in a time of 17:52.16. As for the champion Eagles, Mason McKibben, Alex Lawson and Alex Mutchler all ran their way to top-10 finishes. McKibben finished in third place with a time of 17:56.25 while Lawson clocked in at 18:12.45, good for sixth. Mutchler crossed the finish line in 18:32.05 to take eighth place in the field of 58 runners. Other Eagles in the field on Saturday were: 26. Jacob Hoffman; 27. Luke Lawson; 28. Carson James; 30. Zach Leonhart; 39. Brandon Bauer; 53. Brock Nolen and 57. Caleb Christman. The Tigers, aside from the champion Tate, saw two other runners claim top-10 spots on the day in the likes of Brenden Ganshorn and Garrett Murphy. Ganshorn took fifth place in a time of 18:03.95 while Murphy crossed the line in 18:45.07 to claim 10th. Other Galion boys in the field were: 14. Braeden Horn; 24. Zach Slone; 31. Kurt Ensman; 32. Mathias Breinich; 35. Mikey Stover; 41. Simon Shawk; 43. Spencer Guinther and 50. Sean Clark. The Bulldogs from Crestline saw their three runners, Dan Kiser, Lucas Cochrun and Ben Sharp, claim 19th, 55th and 56th, respectively. https://www.galioninquirer.com/wp-content/uploads/sites/38/2018/09/web1_champions-and-runner-ups.jpgPhoto submitted by Noresa Nickels The Galion cross country teams were in action at Amann’s on Saturday, competing in the annual Crawford County Meet. The Lady Tigers took home the title while the boys finished as the runner-ups. Braxton Tate won the boys event by more than a minute and a half over Colonel Crawford’s Braxton James.